I've been a fan of Bobcat Goldthwait since his stand-up days but his recent effort behind the camera has really made me take notice of what he has to say. His latest focuses on Frank, a terminally ill man who is disgusted with our society and begins a killing spree aimed on who he deems sickening. 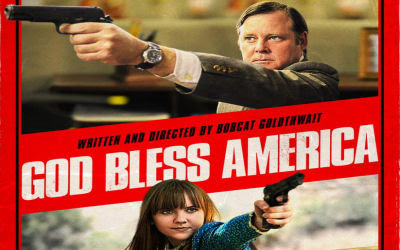 "God Bless America" is number ten on my most anticipated for 2012 and having now seen this trailer, that ten should be listed in uppercase bold because it looks like Bobcat has another solid movie on his hands. Check out the Red Band Trailer below. Goldthwait is clearly touching on a number of levels of disgust with American society. This is a theme that filmmakers have been touching in various levels as of late. Two fresh examples are "We Need to Talk About Kevin" and "Carnage" both of which look at parenting in America. There are plenty of other examples that take aim on other various aspects in our society that people just seem to try and ignore instead of confronting it. "God Bless America" looks to not just confront these issues but blow their heads off. At the end of the trailer we hear Frank explain his actions by saying, "I only want to kill people who deserve to die. I know it is not normal to want to kill, but I am no longer normal." Goldthwait definitely looks to pour on the violence but the message behind all the killing is good. This is like Oliver Stone's "Natural Born Killers" with a real message. A message that asks, "Why have a civilization if we are no longer interested in being civilized?" 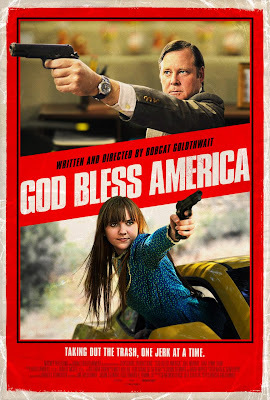 "God Bless America" hits VOD April 6th and will have a limited theatrical run beginning May 11th.